Governor Inslee: It’s time for a fair COLA! Below is the text from a petition to Governor Jay Inslee, initiated by Washington Public Employees Association. Other unions representing state workers are also planning actions, and strategizing on how to stop the austerity and concessions that the Washington State Legislature has imposed on public employees, since at least 2008. State workers are being told to tighten their belts at a time that huge corporations are raking in record profits. Let’s remember that Gov. Inslee helped Boeing get $8 billion in tax breaks! Please go to the link at the bottom of this page and sign the petition. The facts are clear: Classified state employees have not received an across-the-board salary increase in more than six years, and during part of that time they sustained a 3% salary reduction. Also during this period, health care premiums were increased by 25% and the Consumer Price Index rose by more than 12%. The conclusion is obvious: Classified state employees need a fair cost of living adjustment (COLA) along with stable health care costs. Governor Inslee: It’s time for a fair COLA along with stable health care costs for classified state employees. DONUTS AND UNIONBUSTING DON’T MIX! 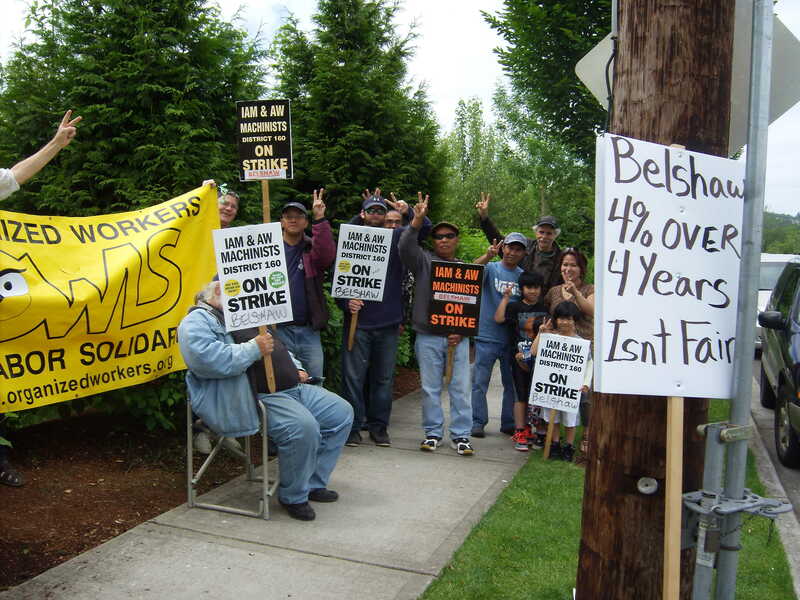 Strikers at Belshaw Brothers on the line in Auburn. If you’ve ever eaten a donut from Krispy Kreme, Dunkin’ Donuts, Costco, or Walmart, chances are the machinery that made the donut came from Belshaw Brothers. Located in Auburn, Washington Belshaw Adamatic employs 62 members of Machinists Local 79. They have been on strike since March and are fighting for the future of their union. Belshaw-Adamatic wants huge concessions from its dedicated workforce. Takeaways include $4.65/hour in pensions (the company wants workers to pay this, rather than the company), and higher costs for healthcare. In return, workers will get a 4 percent pay raise over 4years. Long story short, while a 35-year veteran might make around $21 an hour now, they would make only about $15 an hour if Belshaw gets its concessions. Another big issue is outsourcing of work. In its latest unionbusting move, the company is saying it wants to permanently replace about half the workforce with strike-breakers it has brought in. The good news is that the majority of strikers are standing their ground. Their slogan is “62 out, 62 in.” Right on! Join their picket line Monday through Friday. And on Tuesday, June 18, Machinists Local 79 will host a solidarity rally and barbecue at the strike line from 9am-4pm. The rally is at the strike line at the Belshaw Brothers factory, 814 44th St., NW, Auburn, WA. Let’s send a message to the bosses that donuts and union busting don’t mix! “Hats off to the 160 victorious strikers at United Natural Foods who withstood nine weeks on the picket line in freezing weather to defend their right to decent wages and union representation,” announced Patrick Burns, a spokesman for Organized Workers for Labor Solidarity (OWLS). The settlement came almost ten weeks after union warehouse workers and drivers walked off their jobs on Dec. 10, at UNFI’s Auburn warehouse, to protest months of bad faith bargaining and the firing of 72 union workers. Rather than negotiate with Teamsters Local 117, UNFI brought in low-wage replacement workers. 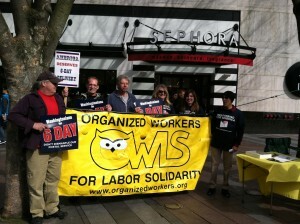 As the strike wore on into early January, OWLS initiated a consumer boycott against Whole Foods, one of UNFI’s biggest customers, to support the workers. Just days before the settlement was reached, OWLS activists also celebrated their own important victory with the announcement that Whole Foods was forced to withdraw charges it had filed with the National Labor Relations Board in an effort to stop the boycott. 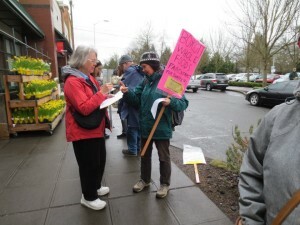 The goal, said OWLS, was to get Whole Foods to apply pressure on UNFI to halt anti-labor activities at the warehouse in Auburn WA. Specifically, boycotters called on Whole Foods to stop using UNFI until the supplier signed a fair contract and reinstated all its union employees. Burns called the NLRB charges filed by Whole Foods a “bully tactic,” aimed at silencing public criticism of its business practices. Corporate lawyers in Los Angeles filed the charge against OWLS and Teamsters 117 on January 18, claiming that OWLS was an “agent” of the union, and “engaged in picketing” in violation of secondary boycott laws under the National Labor Relations Act. Its lawyers withdrew the charges ten days later. “These claims were clearly frivolous,” said Burns, “OWLS is an independent, grassroots, all-volunteer organization of labor activists who promote the unionization of all workers, especially the lowest paid. 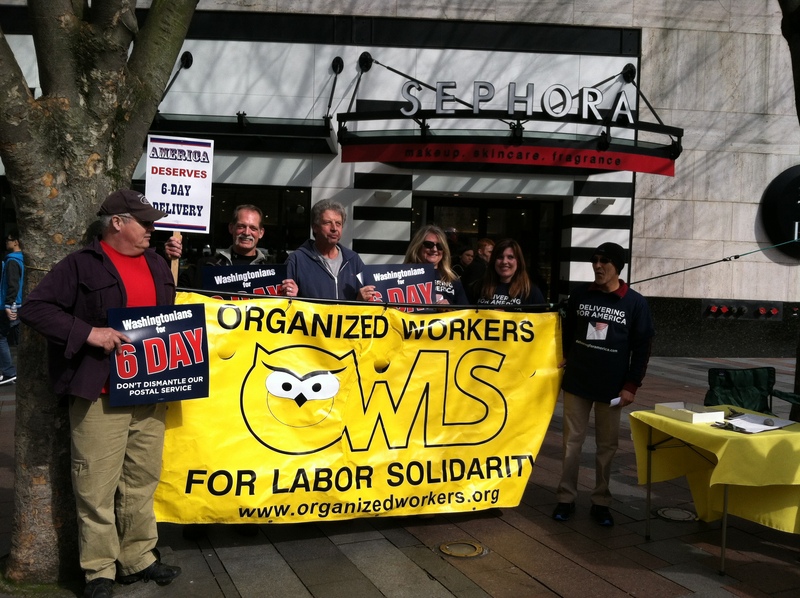 Employers and NLRB laws attempt to hamstring unions from broadening the economic impact of strike actions, but community organizations like OWLS are not under the NLRB’s jurisdiction, and we have no intention of giving up our free speech rights. “We pride ourselves on being a gutsy, multi-racial alliance of workers from numerous different unions, as well as the unorganized. For the last five years we have supported numerous strike actions and organizing efforts, and the victory by the UNFI workers makes us realize how important our role is. “Despite the intimidation tactics by Whole Foods, we kept expanding the boycott and enlisting endorsers.” Several unions and community organizations signed on to support the boycott, including: Food Justice Project of the Community Alliance for Global Justice; Retired Public; Employees Council, Chapter 3; Office and Professional Employees International Union Local 8; Seattle Solidarity Network; Seattle Radical Women; Vegans and Organic Food Lovers for Justice; Freedom Socialist Party; Washington Federation of State Employees Local 304; and Amalgamated Transit Union Local 587.